We know that there are many individuals who have passion and desire to get an education. However, due to limited resources, the most many can do is just dream. Being strong advocates for a good education system, we have decided to walk with the less-privileged and are now offering a scholarship opportunity to the deserving individual. We are targeting students who have a knack for writing and would want to further their skills in different fields. We are aware that there are many bright students who are finding it hard to pay school fees leaving alone maintaining their upkeep. Some are even thinking of cutting short their education because of the economic hardships. The financial difficulties are threatening the growth and prosperity of such individuals, who although intelligent, are unlikely to finish their course or further their skills. Through this scholarship program, we will help the needy but intelligent student advance his/her education. The successful applicant will be the one who is eligible and can prove that he has unique writing skills and the award is USD 2,000. This scholarship is open to any student who is currently pursuing or studying a course in any field. It’s open to individuals from all countries and there is no restriction based on the geography. 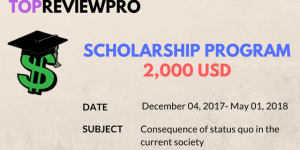 Applying for the scholarship is free of charge. If you meet this criterion and have a passion for writing, you are encouraged to apply. Note: Each applicant is allowed to send one application only. 3. Disqualification: Failure to strictly follow the above requirements will result in your application being disqualified and the decision is final. The applicant who emerges into the top will be awarded an amount of Two Thousand US Dollars (USD 2,000). 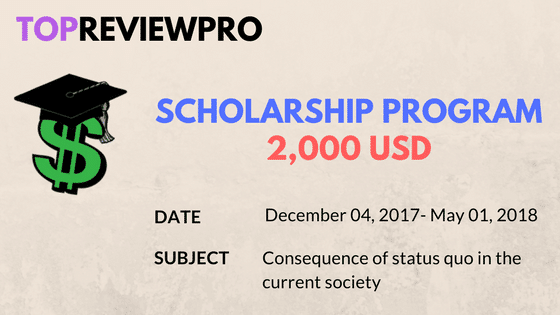 For further information, pleae do not hesitant to contact us via scholarship@topreviewpro.com. We are available to answer any questions in regard to the scholarship. Remember, sending the wrong information or not following the requirements may render you ineligible.